Even today, with the Green Revolution well under way and sustainable practices a goal of more and more people, we still see landscape designs that reflect the disposable society of the past, where longevity was not considered. Banyan Tree Landscape Construction, LLC sees resiliency—using methods, materials, and design that truly will stand the test of time and nature—as the greenest of all movements. We strive to create a natural landscape system in a way that will flourish in time. From retaining walls and patio installation methods built upon solid foundation to organic soil amendments which provide a bountiful habitat for plant life, our design process starts with professional quality products installed with the highest of standards. The solid features of a landscape, concrete and masonry are among the more popular project types requested of Banyan Tree Landscape. Click here or on the image above to see examples of our designs. Banyan Tree Landscape Construction began as a landscape company focused on landscape and irrigation design and installation in Medford, Ashland, and Jacksonville, OR. 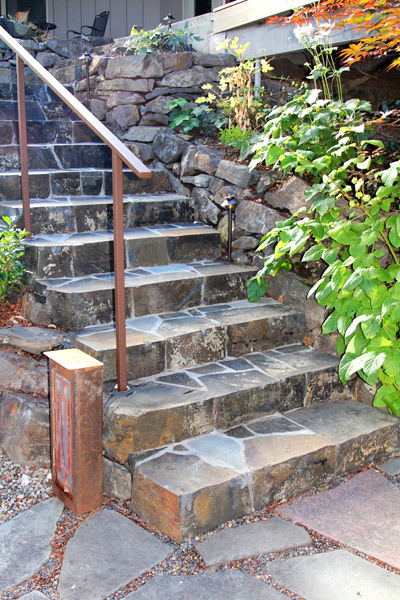 Over the years we’ve acquired some of Rogue Valley’s most highly skilled and experienced stone masons. Thus began the hardscape division of the company, including custom concrete, flagstone, stone retaining walls, concrete pavers, block masonry, and segmental block retaining walls. The masonry division has greatly improved our capability to serve as an all-phase landscape contractor for Southern Oregon. Landscaping companies throughout Medford and Ashland provide services over a wide range of quality and expense. Banyan Tree Landscape Construction offers the highest quality landscape service at a very competitive price when compared to equivalent quality. Banyan Tree offers a full line of landscape maintenance services including Lawn Care and Garden Care and look forward to extending our property management throughout the year to our clients. Please enjoy our website and find images of our many services including shade arbors, trellis, fences, decking, water features, landscape waterfalls, rock fountains, agricultural irrigation, landscape and low-voltage lighting systems, natural swimming pools, specimen tree planting, on so much more. We utilize natural and organic products when possible and have years of experience to recommend low impact approaches to ecological landscape design. “Like” us on our Facebook page to see postings of current projects and other useful landscape related information. Follow our Blog to receive current news and offers and follow our YouTube channel to see our ever-increasing portfolio of landscape videos. We look forward to hearing from you!